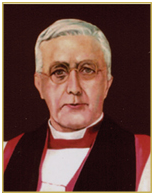 Rt.Rev.Edward Alfred Livingstone Moore was the fourth Anglican Bishop of the erstwhile Anglican Diocese of Travancore-Cochin, which later became the Diocese of Madhya Kerala of the Church of South India. A Scholar with an M.A from Oxford, he left behind his high academic pursuits and decided to come to India as a missionary in 1902. This slender, good looking and energetic Anglican clergyman, with his deep sincerity and refined manners, won the affection and regard of all who came into contact with him, in no time. He took charge of the CMS College, Kottayam as its acting Principal at the age of 32. 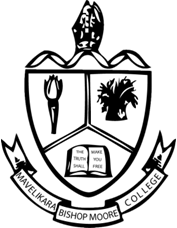 His ability as a lecturer in English, his co-operation with his colleagues, his simple but practical sermons in the College Chapel, the discipline he exercised , tempered with mercy, were all admired by the student community. He studied the South Indian languages to effectively carry out personal interaction with the ordinary people of the land. Appointed and consecrated Bishop by the Archbishop of Canterbury, he served the Diocese from 1925 to 1937. His simplicity and complete detachment from the world and its charms marked him as an exceptional man of God. Bishop Moore was a bachelor of rather austere and ascetic habits, and far from taking a salary, put back his allowances into a diocesan fund. With a concern for the under-privileged , Bishop Moore started clinics in country boats called ‘Floating Dispensaries’ to take medical aid to distant places in water-logged areas. He was shy but firm, detached , but attached to the good values of life. The firm stand he took against mass conversion and his determination to accept only genuine seekers were appreciated by Mahatma Gandhi, who visited the Bishop at his residence, when he came to Travancore at the time of the famous Temple-entry proclamation. Bishop Moore College, Mavelikara stands as a tribute and memorial for a saintly soul whose clarity of vision, commitment to his call and concern for those under his care continues to be an inspiration.